Have you ever found a placemat that is SO pretty but it doesn't match your decor? I have... and I go ahead and buy them so I can make a pocketbook or purse. Explore these free directions and patterns and then make your own placemat or find the bargain section for a super economical purse! Take your time and gather all kinds of ideas from the variety of free directions that are available. 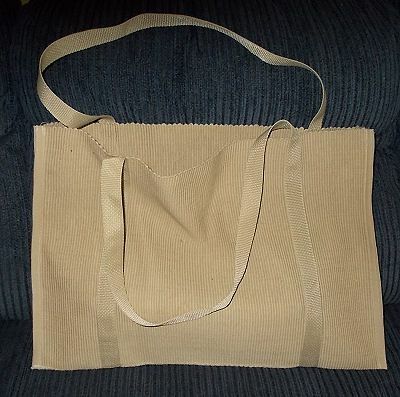 This is one of the most durable tote bags you can sew at such an economical price. By using two placemats you are sewing with a durable fabric and the detailed, step by step directions are perfect for anyone who wants to sew. The straps envelop the entire bag so it is an extremely durable tote bag. This set of instructions uses a single placemat and purchased purse handles to create a simple ​handbag that could be used for almost any occasion. A beginner can easily handle these directions. These free instructions will make a great handbag that has a rectangle handle within the fabric and is constructed from one rectangle placemat. Step by step directions with photos will guide you through the process. These free instructions have detailed step by step photographs to go with each and every step of making a placemat purse from one rectangle placemat with purchased handles. These placemat purses are a sight for sore eyes! You'll find some great ideas that might now work as an actual placemat but they will make a great placemat pocketbook! Using these directions, you can reuse handles from one purse to another so you don't have to buy handles for each and every bag. These directions offer a variety of shapes to make placemat pocketbooks but the directions do lack photos to guide you. The text is excellent so you shouldn't have a problem following along without pictures. These placemat pocketbooks have a different look even with the easy to follow directions. Take a look around and make yourself a variety of placemat purses! This PDF file offers you step by step instructions to sew a simple rectangle purse form a single placemat. These instructions offer illustrations rather than photos for a simple to print format.